The sound of trains’ rumbles and whistles echoing through Elon University’s campus and the town is a familiar sound to generations of students and town’s people. Today, the Town of Elon does not have its own train depot, but for a long time there was on that was an important part of the community and school. 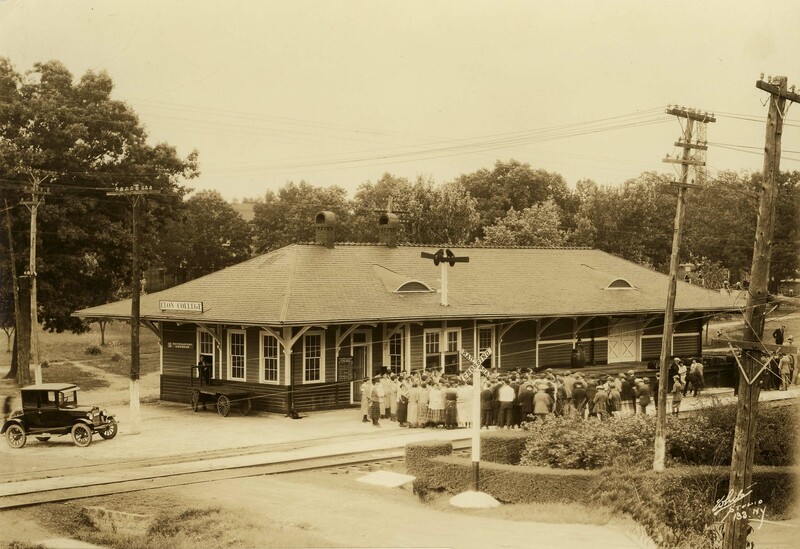 The Town of Elon College train station in 1922. The original train depot in the Town of Elon was built for handling freight on railroad locomotives at Mill Point. The train stop became an important way Elon College students arrived and departed from campus. According to a September 9, 1927 article from Maroon and Gold titled, “Trains and Busses Bringing in Students from All Sections,” in the opening week of school, students came from 16 states and two foreign countries during that year. Around 1961, the Southern Railway gained permission from the State Utilities Commission to remove the depot that stood between the railroad tracks and Lebanon Avenue. This decision came after the passenger and freight traffic became unprofitable. After this depot was removed, the town of Elon remained a stop for passenger trains only.